Over 500 pins and beads later, it's done! Especially since, as I already mentioned, it didn't turn out at all the way that I had intended it to. But that's OK, no beating myself up about it. 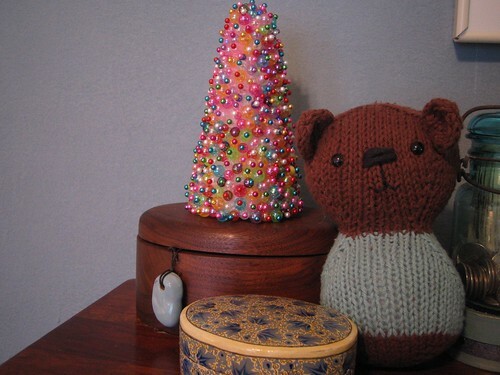 Just going to appreciate it for what it did turn out as - a fun, silly little candy bobble tree. I've got a collection of stuff which sits on the dresser, year round - a combination of things that I like to look at, and useful stuff - so I just plopped this into the mix. Not really formal at all, but it works for me! The large wooden box was a presenter's gift, given to me after I made a 90 minute presentation to 500+ lawyers about the Internet. (This was in the earlyish 90's - when it was still a fledgling technology. I remember that the many people came up after the presentation and made comments about how it seemed cool, but they didn't know if it would really affect the way they did their jobs...) I love it because it is gorgeous, but it also reminds me of a time when I, too, was considered to be a professional. The gorgeous stone pendant is from MollyCoddle and I just love it. I leave it sticking out of the jewelry box because it reminds me to wear it (I have a bad habit of sticking things in these boxes and forgetting to wear them) and because it's lovely. An old jar filled with quarters, etc. I have somewhat of a collection of old Ball/Mason/etc. jars - but this is the only one that is in this room. At the day's end, I troll my wallet and Bubba's pockets for quarters - and they all end up in this jar. I have a self-imposed rule that I am not allowed to spend quarters (and it pains me mightily when Bubba spends them in front of me...) I save them up for three months, and then at the end of the "fiscal quarter" I take them into the bank and deposit them. The proceeds all go to a 529 plan for Schecky. Don't worry - this isn't his only college savings vehicle, but I decided when he was a little tot that every little bit would help. And it does - I manage to save between $300 - $400 a year this way. A few years back, Schecky and I were actually in the newspaper in an article about "What do you do with your change?" I know it's not an overwhelming amount, but I am a firm believer in "EMILY" - Early Money Is Like Yeast. By socking away tiny bits now, it can grow for the next ten years and be a tiny bit more when the time for college comes. It's painless, and did I already say that every little bit counts? I love your tree. And the top of your dresser. And all the stories that goe with it. And I have a very similar molly coddle pendant hanging where I will see it in my house, too. the tree is darling! i have to admit i bought the styrofoam base a couple days ago after seeing you start yours! What a beautiful tree. Now I want to make one. I love the story behind all the items on your dresser. your tree looks good enough to eat and not at all obscene! good show! bravo! Your tree turned out so well! I love all the meaning behind the stuff on your dresser. I think that's what a home is all about. I love that tree! Those colors... wow. your tree looks so great!!! Congratulations on finishing it. I am still working on my garland one. Coleman was with me in Michaels the other day and asked if he could do some trees with Mardi Gras beads. Why not, let's give it a try.... We should have spray painted the cones first, but they look good.... still a work in progress! that tree is gorgeous! I have two of Molly's pendants and I love them so. I love you little candy colored tree! Also thank you for sharing your treasures & their stories. Holy moley. You should be so proud of yourself with that Christmas tree. It is gorgeous!! I finished a similar tree, made with buttons, here, http://mamanjackjack.blogspot.com/2006/11/button-button.html and I have to say that I also feel NO need to make another! Lovely! I like your little tree! So pretty...and quite inspiring. Your spare change savings is a good idea. We're doing the same - I have 2 piggy banks - for our retirement. It's not the only thing, but hey, every little bit helps! 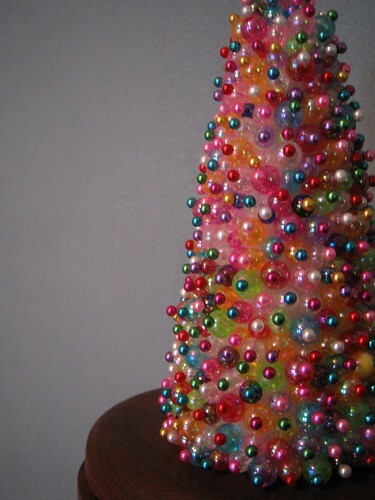 That beaded tree is amazing! If I hadn't already been to the craft store twice in the last 24 hours I'd go back for stuff to make that. I'll have to be adding it to the list of things to make for next year. I can't get enough of that tree. I love your site and go back to look at tree for inspiration. The color, the festivity, it's beautiful. Keep up the creative work. Your tree is beautiful! I made similar ball ornaments many years ago (1960's) and they've grown to be some of my favorite Christmas ornaments!